Oh man, $500 purchase for the 5B from Innovative. In my sole mission to keep the economy going, I just dropped $500 to Innovative for a 5T conversion on my 5B SS. I basically did a 5T conversion (front bumper, side guards, body mounts, etc.) 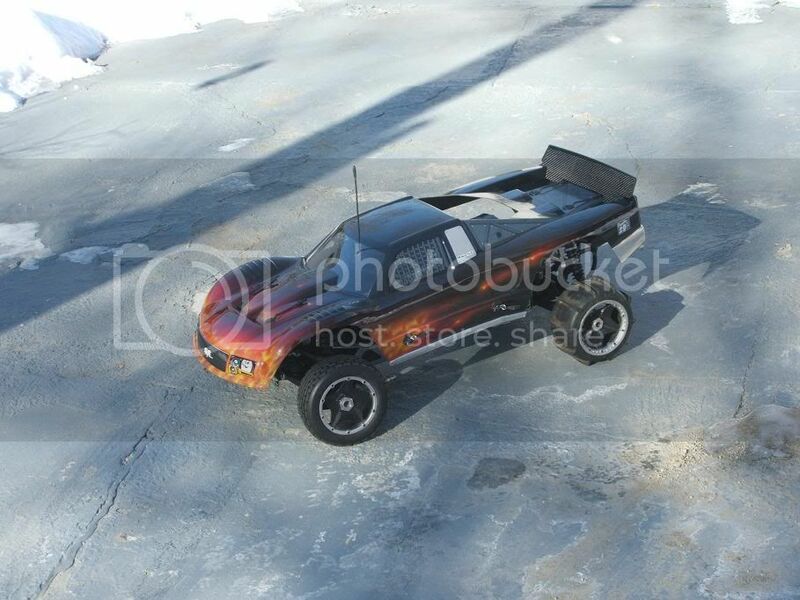 with the Proline Desert Rat Body, and Proline wheels and tires. RE: Oh man, $500 purchase for the 5B from Innovative. do you need axle extenders on the front to have the wider tires installed? It is supposed to be a direct bolt on according to proline. From Proline "Converting to the Pro-Line 5T is easy. Simply purchase the Desert Rat 5T body (part # 3292-60), Excavator tires (part # 1148-01 x 2) and Desperado Rear wheels (part # 2707-01 x 2 black/chrome, or 2706-03 x 2 black/black). Due to the added offset of the rear wheels, they are used to convert the 5B into a 5T, instantly." Thanks bud, I do what I can for my country ... I kept kicking around selling the 5BSS and getting a 5T but in the ended I wanted the ability to switch the bodies and wheels/tires back and forth to suit my mood. Agreed, but I don't like the way the Proline body mounts with the included mounts. It probably sounds dumb and OCD, but those 4 posts sticking through the top of the body look silly to me. That is why I chose to use the stock 5T mounting side and upper mounts. The stuff shipped within a few hours of my order. The parts will be here in two days from the order using UPS Ground. Those guys have a new best friend. I can't wait to build the truck up. Ah! Nice find, and when you get you 5B all 5T'ed, post it! I personally have not seen a 5B converted into a 5T. This one should be interesting... It is a combination of proline and HPI parts, the likes of which I haven't seen yet. That is going to be a BIG body to paint. I think it will be a combo of airbrush and rattlecans. I'm in the middle of doing it as i did not sell the airbrushed body i did with true fire... body posts are on the way. ALSO,Dont use a can to paint the body its a $200 body and it deserves better then a can....if i can help anyway with the paint ask ...il do what i can ...the bods to nice for a can....atleast a pearl or something. I meant that I would just use the cans for backing and large single color sections. I will still airbrush a pattern in the body for sure. What does your true fire body look like? i think 150 dollars for a lexan body is way overpriced. but it looks great! try $200 plus shipping LOL ...... but know that i have the body in my hands and see how HPI did it.... its easy for me to see $200 for it. The stickers for it are big and very nice .... the bag it came in even. The body is JUST BIG! Theres no way anyone is making this body this good without the correct forming system ...NO WAY. Its just sitting on the baja ...no body posts yet....im waiting for em.